No matter what type of air compressor or blower you are using, you should be using an air intake filter. Dust, smoke, water, oil spray and other airborne contaminants can greatly reduce the life of your equipment. Don't allow them to enter your delicate air compressor or blower unfiltered. Specifically designed to fit your original equipment, our air intake filters offer equal to or better than performance based on each manufacturer's stringent specifications. 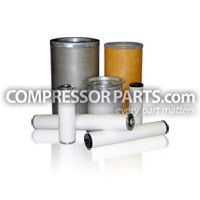 Since our suppliers specialize in filtration, they are able to take OEM requirements and combine that knowledge with their filtration experience to build a superior filter. An Compressorparts air intake filter holds its shape under pressure and will maintain the maximum surface area for improved performance. Its rigid construction helps maintain even pressure differentials keeping filter from collapsing and shutting down your compressor. Because of how it's constructed, you won't find one of our air intake filters failing prematurely. Built with such features as steel metalwork, nylon end-caps and metal to metal welding, with our air intake filter your compressor can perform better and last longer. Compressorparts is an independent supplier of aftermarket compressor replacement parts and is not affiliated with manufacturers mentioned in this web site. Original equipment manufacturer (OEM) names are the trademarks of each manufacturer. On products marked "equivalent" or "replacement," OEM names and part numbers are for reference only.